The 7th annual conference of EuroISME was held in Brussels from 30 May to 2 June 2017. EuroISME has been founded in 2011 as the European chapter of the International Society for Military Ethics (ISME). The society brings together scientists, academics and military practitioners engaged in research as well as in education and training in the field of professional military ethics. EuroISME aims at establishing a European forum for the discussion and exchange of ideas on professional responsibility and military ethics and promote comprehensive and systematic analysis in the field of military ethics and of the law of armed conflict in accordance with the principles of humanitarian law and human rights. These questions and many other topics were presented and discussed during the three days of the conference with competent keynote speakers and panellists participating at plenary discussions as well as workshop sessions. 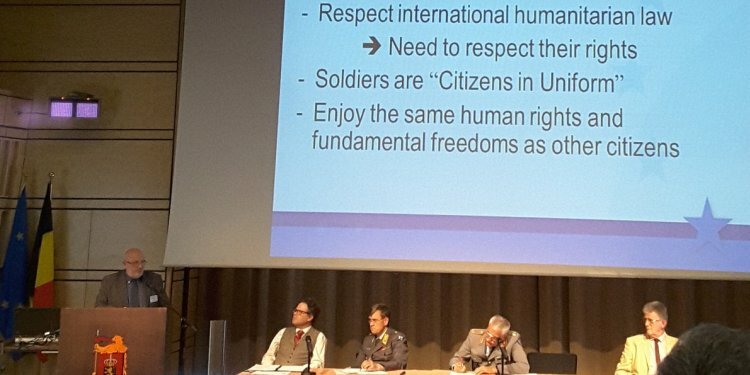 EUROMIL was invited to participate at a plenary panel session at which the Director General of the EU Military Staff, Lieutenant General Pulkkinen, delivered a keynote speech. In his speech, the General highlighted that the security environment has changed and that we are moving away from the safe years. “Training ethics to the soldiers is vital, it is a lifelong process” Lieutenant General Pulkkinen said. “A good soldier should make ethical and judicious decisions which should come from the backbone, since the decisions are often made under stress” he added. In this context, he touched also on the importance of integrated training, pre-deployment training, respect for human rights and the importance of gender. EUROMIL’s President Emmanuel Jacob reacted on the speech by highlighting the ten recommendations that have been drawn up by EUROMIL in 2007. Ten years later, anno 2017, these recommendations are still relevant. Even if significant changes have been implemented in the field of for example pre-deployment training, it is still needed to remember these recommendations. In reaction to the keynote speech President Jacob also touched upon the shift between internal and external security as one of the main challenges for the near future. The 7th EuroISME Annual Conference was closed by announcing the 8th Conference to be held in Toledo (Spain) in May 2018. The theme of next year’s conference will be “The Ethical Implications of Emerging Technologies in Warfare”. One of the conclusions of a presentation of Jamie Williamson of the International Committee of the Red Cross (ICRC) was that the nature of warfare and conflict is changing rapidly in ways that present challenging ethical and legal dilemmas. The discussions will focus in particular on three important areas: the technology, the ethical and legal considerations and the question if the emerging military technologies are changing the nature of the relationship between civil society and the military?